When I was a kid, my favorite thing to do was convince my parents to take me to Chuck E. Cheese’s so that I could play skee-ball. I loved playing that game – heck, I still do! That’s why I was super excited when I realized that I could actually buy my very own home skee-ball machine for the basement game room. Sounds pretty awesome, huh? That’s cause it is! As an adult, I’ve been getting my skee-ball gaming on whenever I’m in a city that has a Dave and Buster’s. But now, I can play whenever I want. If that sounds as awesome to you as it does to me, then let me help you relive those childhood memories by telling you how to get your very own skee-ball machine for home use. Below you’ll see some of my recommended models as well as some tips on shopping for one of these. Should You Buy A Used Skee-Ball Machine? So, I’ve got you interested in adding one of these awesome machines to your family game room. Now, let’s make sure that you get the perfect machine for the job by answering some of the questions below. Are you a cool adult like me who is just buying one of these for yourself? Or do you have kids at home who will also be playing the game? If so, are these teenagers or younger kids? The reason that this is important is that you want to be sure that you choose something that is kid-friendly. Or, maybe you’re buying one of these just for the kiddos – if that’s the case, then you probably don’t want to spend a fortune on one that teens and adults can enjoy. Knowing who you’re shopping for first will help you pick the perfect skeeball machine. If you live in a small apartment, condo or townhouse, then I have some bad news for you – one of these is probably not gonna fit in your home. In case you haven’t played one of these in a while, they are really long and take up a lot of space. You need a good sized family game room, a basement or a garage where you can put it. One average these things are close to 9-feet long and around 5-feet high in the back. If you’ve ever looked into buying an arcade cabinet, then you know what I’m about to say. Skee-ball machines for home use are not cheap. There are a couple of models that I’ve seen available under $1000 brand new, but the really nice machines will run you a few thousand dollars. To help make your decision just a little easier, our editors have taken the time to share some of their thoughts on the top skee-ball machines on the market. Check out their reviews below. If you want to play skeeball at home on a machine just like you’ll find at the arcade, then this model here is a great choice. Keep reading out Skee-Ball 2010 Alley (10 Feet Long) Review to see what our editors think of this model. The Skee-Ball 2010 Alley machine gives you that 80’s arcade-style vintage skee-ball machine design that you know and love. It’s got the standard electronic display that shows your score and the number of balls that you’ve rolled. This is exactly like the ones we used to play at Chuck E. Cheese! One of the really cool things about this particular model is that you can set up several of these side by side and have your home game room looking like a freaking arcade. Then, you can test your skills against your friends! Just make sure you have plenty of space for it, since it is 10 feet long. And make sure it’s not going upstairs since this thing weighs in at around 540 pounds. Overall, this is a quality commercial skee-ball machine for home. It should last you and your family for plenty of years of fun game play. The only thing we don’t like about it is the price, which is several thousand dollars. 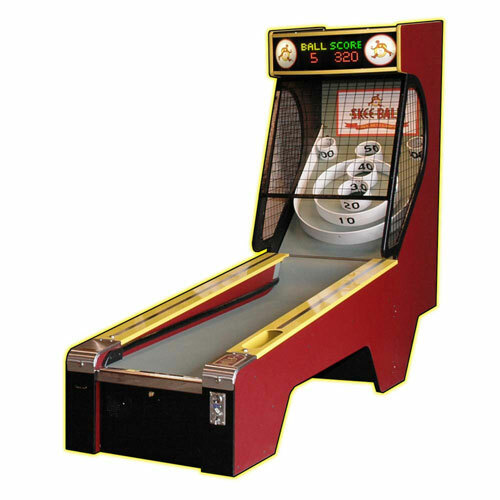 Looking for a skee-ball machine under $1000 that has a vintage skeeball machine look? If so, we highly recommend this model from Boardwalk. Keep reading our Hathaway Boardwalk 8-ft Arcade Ball Table Review to see what our editors like about this model. As you can see in the image, it has a more old school look to it than the model reviewed up above. And this retro skee ball machine has a cheaper price than a lot of models on the market. One positive feature of this model is that it weighs a LOT less than the model listed above. Since it is made out of MDF, the weight for this one comes in at just over 100 pounds! You’ll find that this one is a good option for younger kids since the balls are semi-soft instead of the traditional hard balls. It’s also important to note that this machine is not as long as the model reviewed above. In fact, it measures in at just over 8-feet in length! If you like the look of the Hathaway Boardwalk model above, but prefer something that’s a bit higher quality, then check this model out. To learn why our editors like this one, keep reading our Skee-Ball Centennial Alley Game review below. One of the first things that you notice about this skeeball game is that it has a cool old school look to it. In fact, it has a 1930s-styled exterior and a 21st century interior this alley is both an enthusiast’s and a collector’s dream. The 13-foot centennial alley boasts traditional colors, authentic flip display and pull handle activation lever. The oak exterior is gorgeously hand finished to impart a true representation of the original Skee-Ball. Of course, this isn’t the right choice for just any home game room. This is a premium commercial-quality skee-ball machine designed for the home owner who is serious about their skeeball game. As a result, it is rather expensive compared to a lot of the home game room models on the market. If you do decide that this is the perfect addition to your home game room, then make sure you have a few friends around when this thing arrives. It weighs in at a whopping 550 pounds, so you’ll need some help to move it around. If you’re shopping for a skeeball game for your teenagers or younger kids, then this model from Hathaway is a decent option. Keep reading our Hathaway Hot Shot 8-ft Arcade Ball Table review to learn what our editors think about this model. The first thing that you’ll notice about the Hathaway Hot Shot skeeball game is that it doesn’t look like the more traditional games. It has flames on the sides of the game and overall it just has a cheaper look to it. Of course, it is one of the cheapest skeeball machines on the market right now, so that should come as no surprise. One of the nice features about this model is that the Hot Shot 8-ft Arcade Ball Table folds up when not in use, for storage and space saving convenience. That makes it perfect for families who don’t have a dedicated game room space at home. Some of the other features you can expect include triple reinforced leg stabilizers, rugged ABS scoring rings to handle intense game play, electronic scoreboard, enclosed scoring field to prevent bounce-outs, and an automatic ball return system. One of the reasons that this is a good option for the kiddos (in addition to the low price) is that playing surface of this table is scratch-resistant and poly-sealed with aiming graphics to help players make the most of each shot. 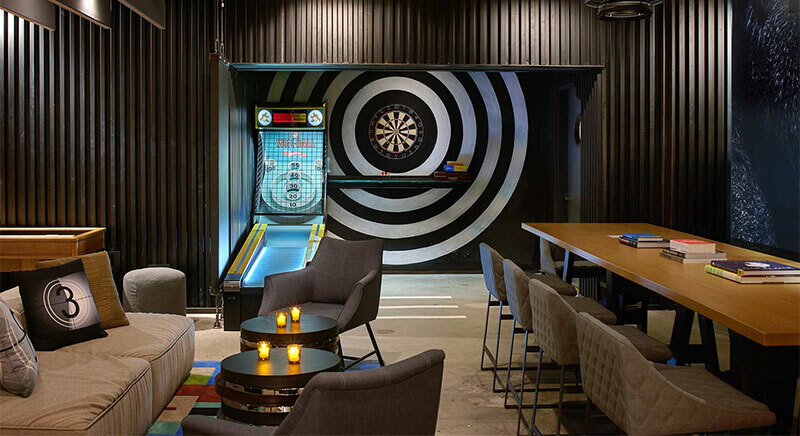 For the serious adult skeeball enthusiasts, we recommend that you skip this table. But, if you’re on a budget or just shopping for the kiddos (or even if you’re only a hobbyist), then the price of this table makes it a good, affordable option. Probably the cheapest option that we’ve seen on the market so far is this table by MD Sports. If you’re interested in knowing what we think about it, check our MD Sports 9 Ft. Roll and Score Table review below. While the best thing about this game is it’s low price, we’re actually really big fans of the design. It has a cool look that is perfect for your man cave or dark wood game room. Of course, at this price the game is a good choice for families with kids since you don’t have to worry about it getting damaged since you could just replace it at this cost. There’s no denying that playing on this table is a blast. It features LED electronic scorer with integrated sound effects and push button controls so you will feel just like you are in a real arcade right in your own home. It also has a built in return system that sends the balls back to you quickly whether you score or miss so that you can square off against friends and family and keep the games fast paced. Even though it’s made of MDF, the classy wood grain finish makes it not only an arcade table but also an elegant furniture. Just keep in mind that at around 150 pounds, it is heavy and you will likely need someone else to help you move it around your home until you get it in the perfect spot for some arcade style action. 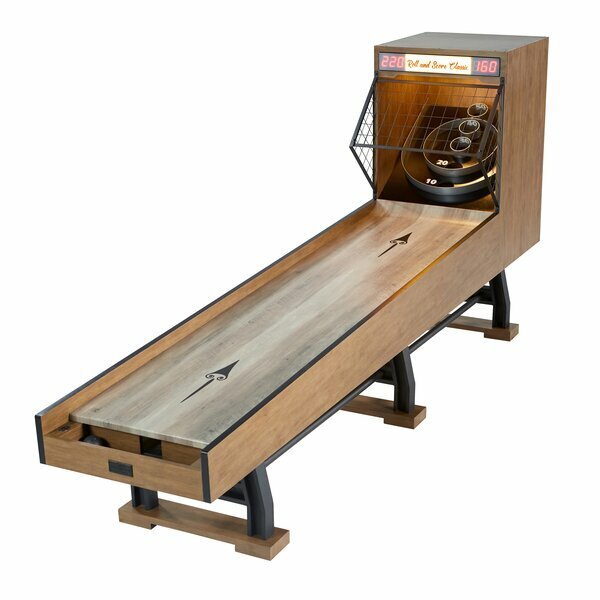 If you’re looking for an elegant skeeball machine for your home that won’t break the bank, then check out this model. Keep reading for our Barrington Billiards Coventry Collection 10 Ft Roll and Score Skeeball Game review to see what our editors think about this one. Like the MD Sports model above, we’re crazy for the design of this modern looking wooden skeeball table from Barring Billiards. And we love that it is priced so affordably. 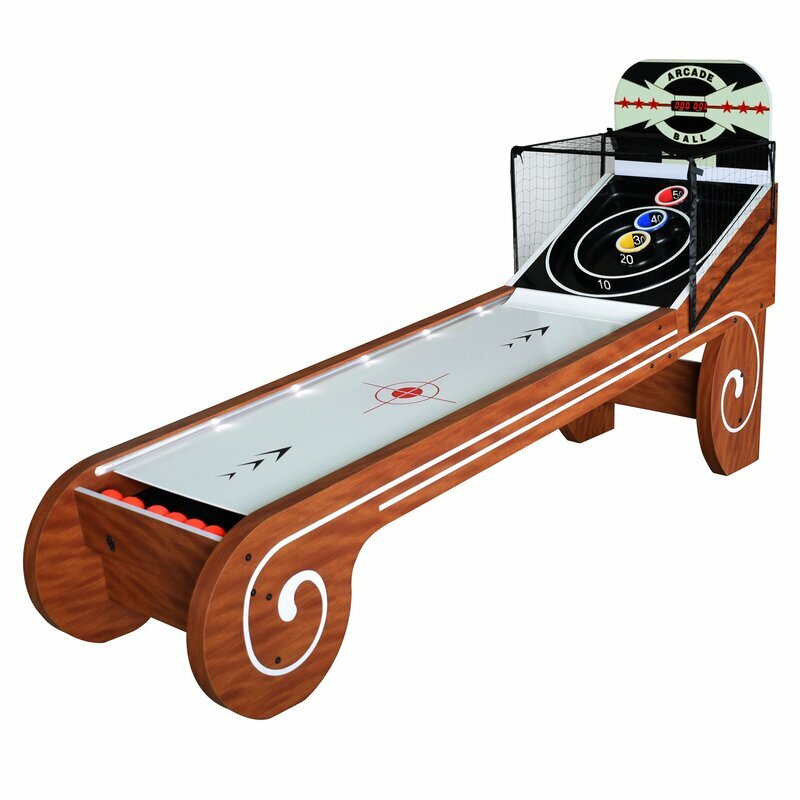 In fact, if you’re shopping for a skeeball table in the under $800 – $1000 price range, then we think that this should be the first table that you consider adding to your home game room. Don’t let the classy look of this game scare you away – you can still have hours of fun on it. This table has a LED lights and an oak finish and rust-resistant metal legs to enhance any game room or basement. Built-in ball return, electronic scoring, and arcade sound effects will keep your family entertained for hours! It does weigh in at around 200 pounds, so make sure that you have some friends around to help you move this thing once it arrives at your home. If you want that authentic arcade experience where you play against other players to see who gets the best score, the you might want to consider this Iceball FX model. Now, if you want an authentic arcade-style setup, then you’re better served by getting several of the Skee-ball 2010 Alley model listed above. But if you want something that has a bit more color and that county fair look, then the Iceball FX is the perfect choice for you. It seriously looks like something that you’d see at an amusement park or a county fair, so the colors and designs are not going to be for everyone. But when you consider the price, and that it has three lanes, then this thing offers a pretty good value for the money. It’s even setup to be coin-operated so you can put it in a bar or other small business. The IceBall FX is the redesigned alley roller with hot, modern graphics, a gorgeous vinyl alley, and all the main electronics right up front for easy access. The new standard for alley rollers with over 50 improvements from the best selling world-wide hit IceBall FX. Incorporates multi-color synchronize LED lighting for a unprecedented light show. Multi-Colored LED can be found on every inch of the 10 foot alley, running up each lane. Even the balls in ICEBALL are unique, taking on the appearance of snowballs, and made of a durable and easy to clean polypropylene plastic. All this beauty and functionality is capped off with a price that is lower than most alley rollers, making IceBall one of the best values in the industry. Just keep in mind that this thing is expensive and really heavy. Plus, it’s a large arcade game, so make sure that you have plenty of room for this thing before it is delivered. I’m looking for a bowling alley skee ball game. Can you help? Sorry, haven’t seen any of those. Have you tried looking on eBay?